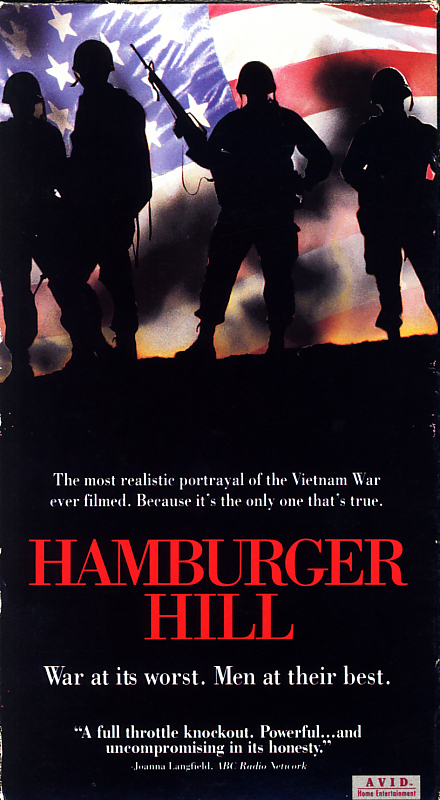 Hamburger Hill on VHS video. Starring Anthony Barrile, Michael Boatman, Don Cheadle, Dylan McDermott. Directed by John Irvin. 1987. Vietnam. 1969. Hill 937. 10 days. 70% casualties. Those are the facts — this is the story. The men of Bravo company are facing a battle that’s all uphill… up Hamburger Hill. Fourteen war-weary soldiers are battling for a mud-covered mound of earth so named because it chews up soldiers like chopped meat. They are fighting for their country, their fellow soldiers and their lives. War is hell, but this is worse. 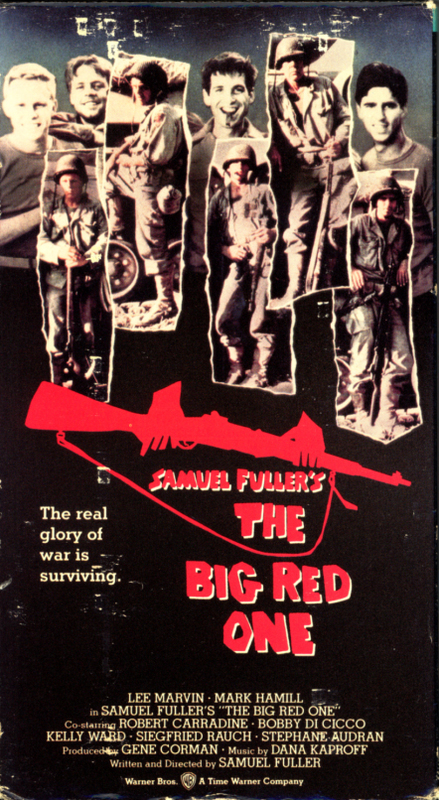 Samuel Fuller’s The Big Red One on VHS. Starring Lee Marvin, Mark Hamill, Robert Carradine, Bobby Di Cicco, Kelly Ward, Siegfried Rauch, Stephane Audran. Directed by Samuel Fuller. 1980. The combat-hardened sergeant squints at the members of his rifle squad. His face is lined and stubbled. The faces that look back are as smooth as summer peaches. They belong to kids right out of high school. And it’s the sergeant’s job to keep those kids alive. The Big Red One, named for the insignia of the First Infantry Division, is the unsparing story of a handful of GIs battling their way from North Africa through Sicily, Omaha Beach and Belgium to the ultimate horror of the Nazi death camps. Academy Award winner Lee Marvin (Cat Ballou, The Dirty Dozen) plays the sergeant, and he’s joined by a talented young cast including Star Wars veteran Mark Hamill and Revenge of the Nerds alumnus Robert Carradine. The writer/director is Samuel Fuller (Pickup on South Street, Merrill’s Marauders), one of the most influential filmmakers in Hollywood history. Fuller was actually in the Fighting First during World War II. He knows that to a soldier, war is no bigger than a single foxhole or a desperate 20-yard run up a beach — and that while generals ask “Will we win?,” the dogface asks “Will I survive?” And that means The Big Red One may be the most immediate, truest war movie you’ve ever seen. “The real glory of war,” Fuller says, “is surviving.” And the real glory of The Big Red One is how powerfully it captures that idea. 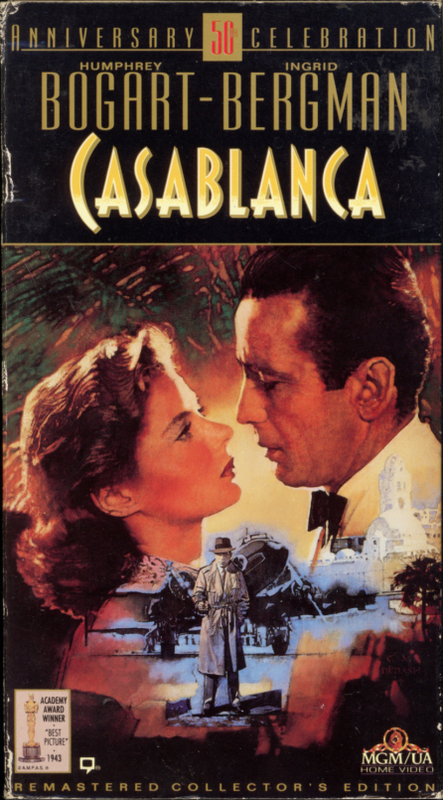 Casablanca on VHS. Starring Humphrey Bogart, Ingrid Bergman, Paul Henreid. With Claude Rains, Conrad Veidt, Sydney Greenstreet, Peter Lorre. Directed by Michael Curtiz. 1942. The time: World War II. The place: Morocco, seething with European refugees desperate for passage to neutral Lisbon. The film: Casablanca, “the best Hollywood movie of all time” (Leonard Maltin). The legends loom larger as time goes by. In the 45th film of his career, tough guy Humphrey Bogart at last becomes a romantic leading man (in a role originally intended for Ronald Reagan). He and luminous Ingrid Bergman portray former lovers briefly reunited in the chaos of war. They’ll “always have Paris.” And we’ll always have their incomparable on-screen magic. Bogart is Rick, a world-weary nightclub owner who claims, “I stick my neck out for nobody.” Bergman is Ilsa, fleeing the Nazis with her Resistance-hero husband. Only Rick can help the pair escape, but he refuses… until Ilsa reawakens his idealism. This 50th anniversary limited edition of Casablanca has been restored and digitally remastered, and includes a “making of” documentary narrated by Lauren Bacall plus the original theatrical trailer. Here’s lookin’ at you, Casablanca.